I have always been daring and independent. Well, maybe not always. In 1st grade I would not let my mother leave me alone in a classroom of new students for the first 2 weeks. 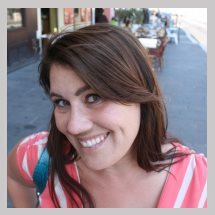 I was extremely shy and afraid of making new friends, but I still had a stubborn streak. Growing up in the Midwest, it was the popular thing to go along with social conventions and not question authority or the majority. The goal was always to fit in. As I grew up this did not always sit well with me. I was (and still am) quite outspoken with strong opinions that are decidedly left. As you would expect, I had difficulty living in a conservative environment. I’m sure I made many people uncomfortable questioning their ideas and ways of life. And, even though I have since moved west, I still struggle with finding that balance in discussion with people I love but don’t necessarily agree with. I was reminded of this struggle today after hearing the Supreme Court’s decision on DOMA and California’s Proposition 8. I remember how excited I was to be moving to California in 2008 for two reasons: 1. It was my first year of law school, and 2. I had the chance to vote against Prop 8. It didn’t even really occur to me that it might pass and people across the State would lose the right to marry the person they loved. I cried when I heard the result and have been a supporter in trying to get Prop 8 removed ever since. Now, over 4 years later, those rights have been returned to Californians. On top of that, the same Federal rights enjoyed by straight married couples will now also be granted to all married couples! Today is a happy day and one to celebrate in history. All this got me thinking about change. Someone recently said to me that change in society moves at a snail’s pace. This may be true but also I like to think that as a society we are getting better at accepting change. I hope that we are teaching our children to accept each other’s differences and appreciate them. They are the things that make us unique. I hope we encourage critical thinking and questioning of authority, the majority and especially ourselves. I hope, as we all get older, we realize that we should never stop learning and never stop growing. By embracing change we can become a better and stronger society. I am not saying that everyone should swing to the left – what fun would that be? I am saying that we should all, every one of us, strive to be more accepting of each other and realize that we don’t have to all be the same. This decision and these revelations come just one week before we celebrate our Nation’s birthday. 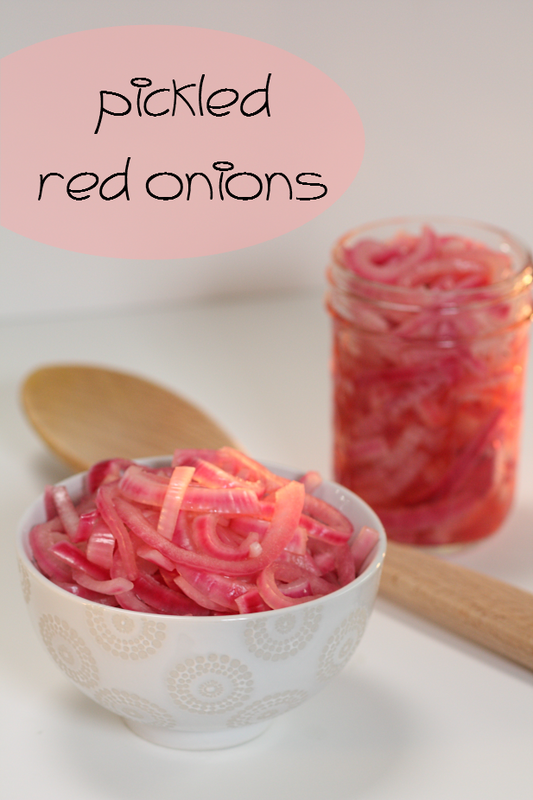 In preparation for this I have been pickling red onions. 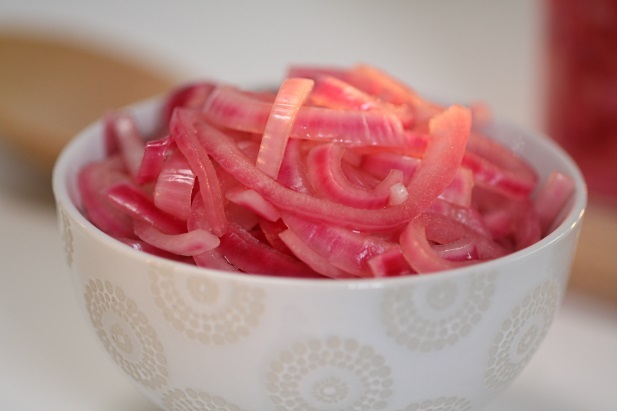 I personally find the red onion to be harsh when eaten raw and the taste seems to linger on for days – not in a good way. But I have found that with a little change, they can be quite delightful. 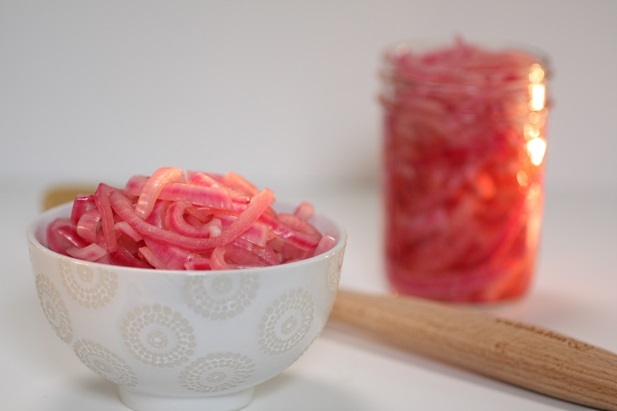 After pickling, they become sweet, a little tart and add a zing to just about anything. The lovely pinkish reddish hue also adds a pop of color to an otherwise boring dish. It might be a small change, but it is impacting. 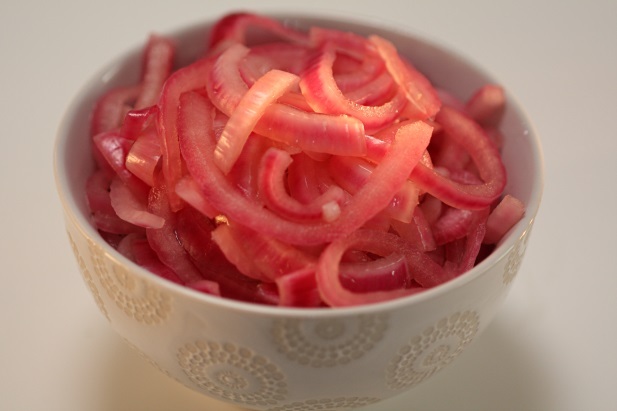 I have added pickled onions to many recipes since I started making them – hummus, pizza, tacos, kale – the list goes on. I always make a large batch because they keep about a month (even though they never last that long!) See, change can be a good thing… And I promise, this change will be quicker than a snail! Slice the onions in half, cutting through the top and base. 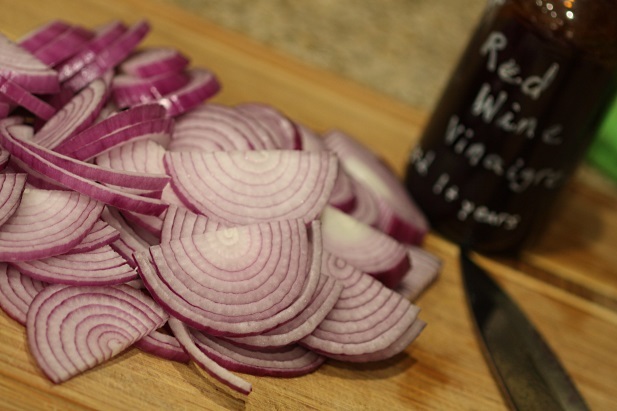 Peel any papery layers off the onion halves, trim the tops and thinly slice the onions. Combine the apple cider vinegar, red wine vinegar, salt, sugar and pickling spice in a medium saucepan and place on stove set at high until mixture begins to boil. Remove from heat and add the onions, separating the rings. Add room temperature water to cover the onions and stir to combine. Cover with a lid and let sit until cool, about 1 hour. 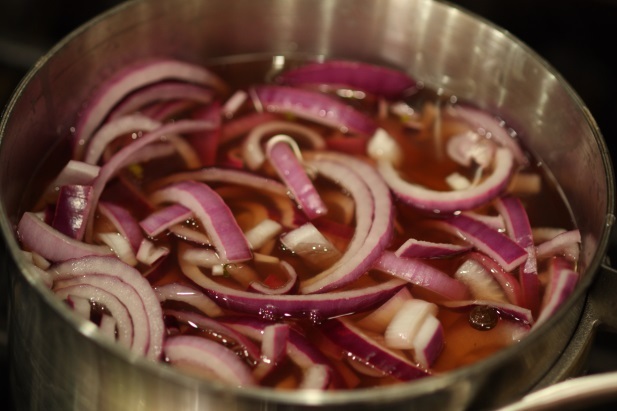 Transfer the onions to airtight containers (mason jars work well) and pour in the brine to fill. Refrigerate and enjoy within a month. 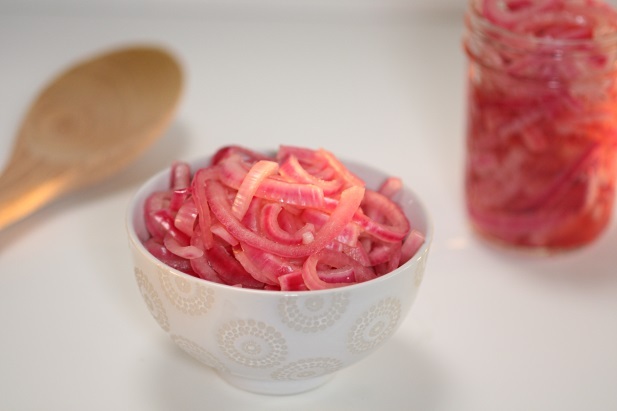 I use a Michael Symon’s (Food Network) recipe for pickling onions but add grocery store pickled beets (sliced or diced), some of the pickling liquid from the beets then thinly slice half a lemon add to the mixture and the juice of the remaing lemon. 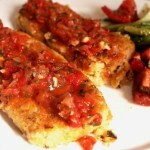 Tart and tasty…I use the “pickled” lemon when cooking fish. Pickled lemon sounds delish! You’re right – it would be wonderful with fish. Oh these onions look so good. I am excited to try this recipe! Thank you, Alicia. I can’t get enough of them which is why I make so much in each batch! Let me know how they turn out for you.